Welcome to our first mini-challenge! Kate and I are always thinking of ways to make our blog better and lately we've been thinking about our formatting. So we thought we'd have you rethink yours as well. You don't have to change anything if you don't want to, but here are some questions to answer. 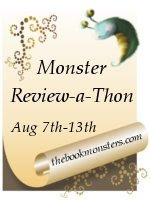 Post them on your blog today, tomorrow or any day during this review-a-thon and then link up back here so you can have a chance to win a book from the Prize List. 1. Are you happy with your review format currently? 2. Scrutinize it a little more, maybe compare it to other blogs you like, anything you think you might change? 3. Implement some basic changes and tell us what you think. Or, you can tell us one or two aspects of your reviews that you like. 1. To show that I'm not a professional reviewer, my "reviews" are called Thoughts on... with Thoughts on...title/author as the post title. 2. Originally, a cover graphic with book info was the first thing but now I write my thoughts first. I like how things look now, feels more like I'm talking to a friend about a great book I read, which is why I started this in the first place. My blog itself is pretty laid back because I was using an older computer but now that I've upgraded I don't know if I'll upgrade the blog or not. I'm still looking for the perfect background/header graphic. I wish I could settle on a rating system. I've seen several that I like, I just haven't buckled down and fixed this. Then the hard part is staying with it! Oh Gina I agree, it's hard sticking with it for me too sometimes. And I definitely could use a change in my background, header, and design overall! But I just havent made time to spend on really figuring out all the technicalities. I know I could do a quick change via blogger but I want something much more persoanlized if I do go through with a design overhaul. So for now I'm holding off on it...maybe Christmas break will do though. I have the same problem with finding a rating system. I feel your pain! Thanks for stopping by. It gave me a chance to find you, too! Now I'm following, and I'll certainly be back. This is so true. I try to make mine more professional but i throw in my personal thoughts into the review. I like my rating system but i dont know if i love it. I guess its just a hit and miss thing.